Today to celebrate π day my daughter and her friends made a Hershey Pie. This pie has become a tradition in our house. Years ago, when we first moved in, there was a huge hurricane in the Westchester area. Many houses were flooded and lost electricity. 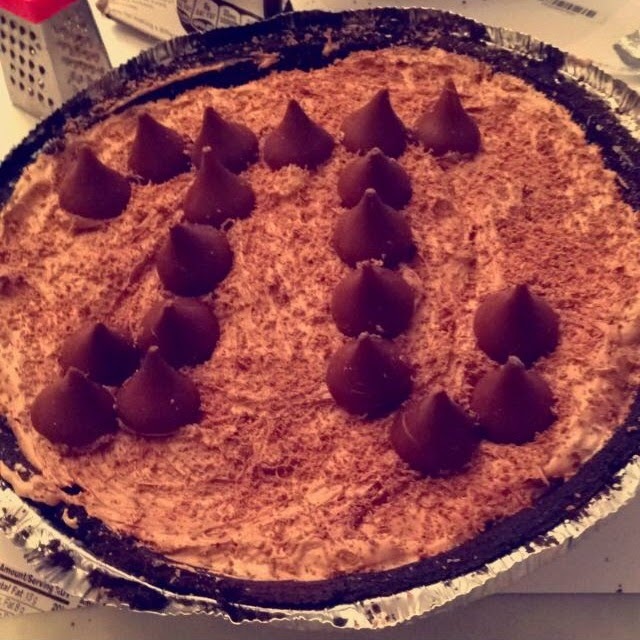 My good friend came over with all the ingredients and we made this Hershey Pie for the upcoming π day at school. We had the best time and it was such a fun day among the chaos of the weather around us. We also made this for a pie contest and it came in 2nd place two years in a row!!!!!! ENJOY!! 2. Add all the Cool Whip and stir until completely combined. 3. Pour the mixture into the piecrust. 4. Decorate your pie with the Kisses and Chocolate Bar shavings from the leftover bar. 5. Refrigerate the pie for at least and hour and serve cold.